Joy Priest grew up in Louisville, Kentucky across the street from the world’s most famous horseracing track. 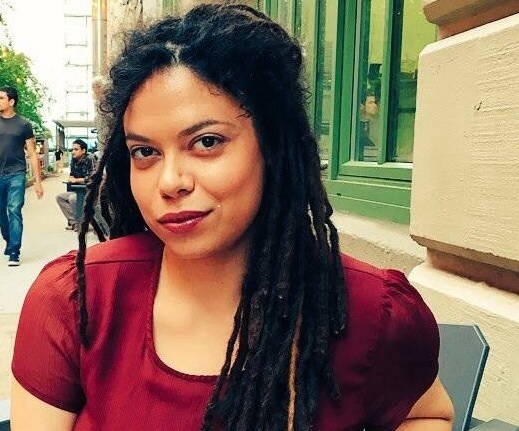 She is the 2018 Gregory Pardlo Scholar at The Frost Place, the recipient of the 2016 Hurston/Wright Foundation’s College Writers’ Award, and has received support from the Bread Loaf Writers’ Conference and the Fine Arts Works Center in Provincetown. Formerly an associate poetry editor at Narrative Magazine and a senior editor at Yemassee Journal, Joy is currently an MFA candidate in poetry at the University of South Carolina. Her poems are included or upcoming in Blackbird, Callaloo, Drunken Boat, espnW, Four Way Review, The Rumpus and the anthologies Best New Poets 2014, Best New Poets 2016, and The Breakbeat Poets, among others. Kicking up a plume of spirits in the dirt. In the desert, everything is invisible. She thinks I am worth a burnt tongue. Meet me at my mailbox. Dangling in my mouth like a toothpick. Our shadow town Underneath the motherboard. My tremoring eyelashes, my heavy teeth. My fattest loc grazing a breast. Of a bronco from the other side.